After 13 years EUROCALL returns to Valencia. Some of the more senior members of EUROCALL will recall the 1995 Conference which took place in September that year, hosted by the Department of Modern Languages. Although e-mail was only slowly emerging at the time, EUROCALL '95 was one of the first conferences in Spain to digitise and publish the abstracts of all the presentations on the web. An emerging world wide web that seemed revolutionary at the time. For anybody who might be nostalgic, the 1995 abstracts can still be accessed at http://eurocall.webs.upv.es/euro95/home.htm. The proceedings of the '95 conference are also a valuable witness of what was prominent at the time in relation to CALL and TELL. Looking back we can see that some of the concerns in the mid nineties are still valid today, for example issues such as integrating CALL into the language curriculum, incorporating speech recognition tools into language courseware, parser analysers, interactive learning environments and so forth. 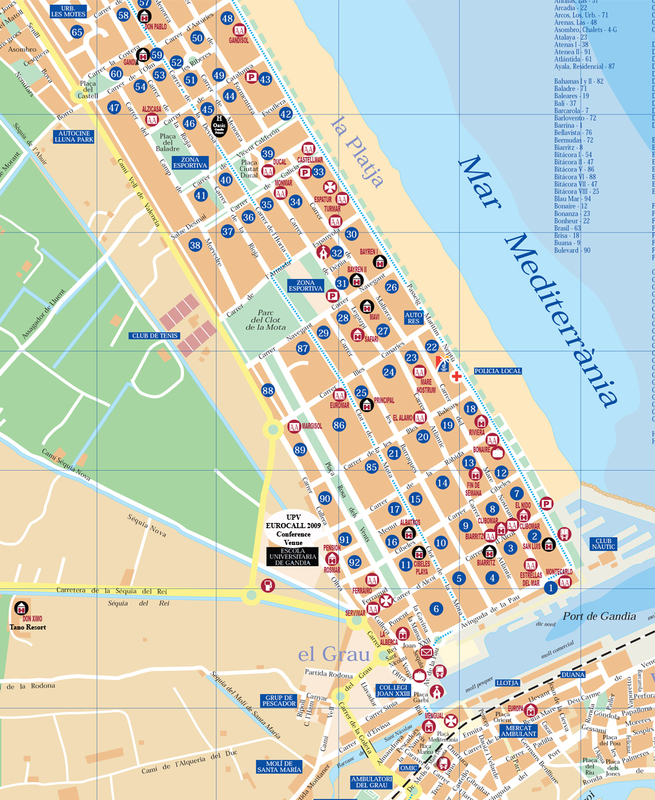 EUROCALL 2009 will also be hosted by the Universidad Politécnica de Valencia, but this time it will take place at the Higher Polytechnic School of Gandia, also known as the UPV Gandia Campus site. The Gandia campus is located in one of the most privileged Valencian regions known as "La Safor" where the Mediterranean Sea and a historical agricultural tradition meet. Well known for its wide golden beaches, Gandia is also historically renowned for its 14th Century Palacio Ducal, house to the Borgia family. We look forward to welcoming you to the Universidad Politécnica de Valencia at our Gandia Campus! !